Though cheap penny stocks are regarded as trading for amateurs, there are plenty of lucrative penny stocks to invest in. Factors including strategic stock splits, poorly timed initial public offerings (IPO), and weakness in the commodities market can affect penny stocks. That said, these factors provide unique opportunities for big payouts with the right penny stock companies. Despite the risk, with a few of the best penny stocks and smart investing strategies can help you minimize risk and reap the rewards. Now, there are ways to find the hottest penny stocks in the market. For example, you can use the Finviz screener to see some of the best penny stocks out there. Here are our picks for the hottest penny stocks to buy today, in no particular order. Arotech Corporation (ARTX) is a defense and security services company with a market cap of $88M. The company operates in several countries and has competitors like General Electric and Honeywell International through their Power Systems division. Additionally, Arotech is a defense contractor that manufactures products for military, homeland security, and law enforcement use. With the current administration’s desire to increase defense spending, Arotech could be looking at a huge breakout. Like all hot penny stocks, Arotech is still a speculative choice. Revenues in 2017 were just over $98M, and 2014 revenues were just over $103M. That said, growth and profitability are still a struggle. For a company founded in 1990, with one division existing as far back as 1971, it has been a slow climb to reach these numbers. In 2017, Arotech earned a profit of 17 cents per share, with a projected growth of 18 cents per share in 2018 and 26 cents per share in 2019. If the company can hit these numbers and multiply, the forward price-to-earnings ratio of 13 looks quite low. Mid-Con Energy Partners (MCEP) is an upstream oil and natural gas producer based in Tulsa, Oklahoma. The company engages in exploration and production. That said, similar to other companies in this sector, its success depends on oil prices. Currently, WTI crude oil prices are trading above $50… and that could continue to rise with the potential supply cuts. In 2013, MCEP stock hit a high of $27 per share. When the oil prices dropped between 2014 and 2016, that rocked the stock. By the end of 2016, MCEP was on the cheap stock list – trading as low as 73 cents per share. However, the stock has been struggling to reach its 2013 highs. MCEP share prices are now trading below $1. As a whole, the company is losing revenue… its revenue dropped from $96.91M in 2014 to $56.1M by the end of 2016. However, the company grew its revenues to $58.93M in 2017, but the revenues are estimated to stay below $60M through 2018 and 2019. Now, those estimates could be affected by higher crude prices isn’t clear, so the stock remains speculative. That said, the stock stayed above $20 per share when oil traded above $100 per barrel. If oil prices climb, MCEP stock has a chance to hit its previous levels from 2013 and become one of the hottest penny stocks out there. mCig Inc. (MCIG) is a marijuana-industry holding company based in Las Vegas. Though mCig got its start with vaporizers, mCig stock has since grown into a full-scale marijuana cultivation and construction company. Currently, mCig operates in Nevada, California, and New York. Knowing that a business has grown to operate on both the east and west coast is a good sign, and this growth could put mCig among the top marijuana penny stocks. The company’s financials are still uncertain. However, with the company earning $1.72M in revenues in 2016 and $4.78M in 2017. Moreover, mCig made $1.53M in profits in 2017. During just the first three quarters of 2018, mCig brought in significantly more — over $6M in revenue. Though this bodes well for the company, mCig stock is still a speculative investment. Rapidly rising revenues and profits could mean big payouts for investors, but mCig shares are still trading under 25 cents per share… that said, there’s not a lot of investor confidence. These shares have also never breached the dollar line, though they came close with 92 cents per share in 2014. The current price is well above the 5 cents a share – where mCig stock traded for so long. Now, if it can maintain this level and continue to grow, its ~$60M market cap has the potential to go much higher. Believe it or not, those results are real. 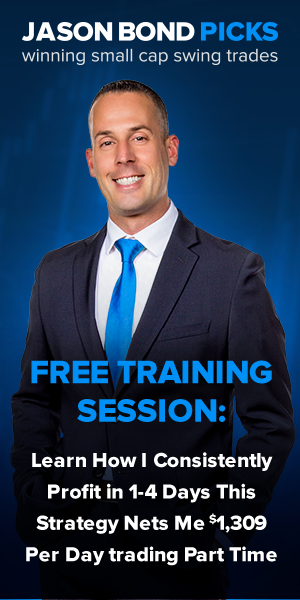 And if you sign up to this free strategy session, he’ll explain how he did it, step-by-step. Tuesday Morning Corporation is a home-goods retailer based in Dallas, Texas. The company has struggled to keep steady profits in a volatile retail environment. Tuesday Morning has been around since 1974 and expanded its operation to 41 states by 2001. However, Tuesday Morning Corporation has been plagued by high turnover in upper management that has taken a toll on its profits. Regardless, TUES operates over 700 stores in the U.S., which is reason enough to consider it as a potential investment. TUES grew its revenue by nearly 50% quarter over quarter. Moreover, the company turned a profit, generating $15.85M in net income last quarter. These figures are encouraging and indicate growth and profit potential. With more than 700 stores around the country, TUES stock price could reach $3.30. Investors should also remember that the company’s stock traded for $22 per share in 2014. If TUES continues to grow its net income and revenues, investors could enjoy incredible gains in the future. The steel industry is volatile, with supply and demand shifts creating situations that make it incredibly difficult for companies like AK Steel Holding Corporation (AKS) to find a profit. This is a very cheap stock, to begin with, and because the company hasn’t moved much in the past 15 years, it’s hardly a sound investment. Currently trading at $5.18 per share, AKS is down from $5.80 per share at the end of 2017, which doesn’t inspire much confidence from investors. The current administration is trying to make U.S. steel companies more competitive with foreign rivals. However, the global economy is shifting for the better, so AK Steel Holding Corporation could be poised for a comeback. Earnings and revenue are expected to grow in the current year and next year, meaning there’s a potential for serious investor profits. PDL BioPharma (PDLI) was established to acquire the rights to, or patents on, highly-marketable pharmaceuticals. This was an effective strategy for some time. However, once other drug developers caught on… they started to engage in the business. Consequently, PDL BioPharma has been struggling to acquire pharmaceuticals and marketing rights at favorable prices. In turn, this caused the stock to drop from over $30 in 2006 to less than $3 in 2018. However, the stock is building some momentum and currently trades around $3.50. The quarterly report for PDL BioPharma Inc. is telling a new story. At this time, PDLI has $532M in the bank, compared to the market cap of $510M. That said, PDLI could pay higher prices for its pharmaceuticals and marketing rights… while still providing shareholder value. Groupon Inc. (GRPN), a daily-deals company, opened strong in 2011 with a price of $28. However, this didn’t last long… shortly after, Groupon stock fell into the penny stock range within a year. It’s yet to trade near that level. 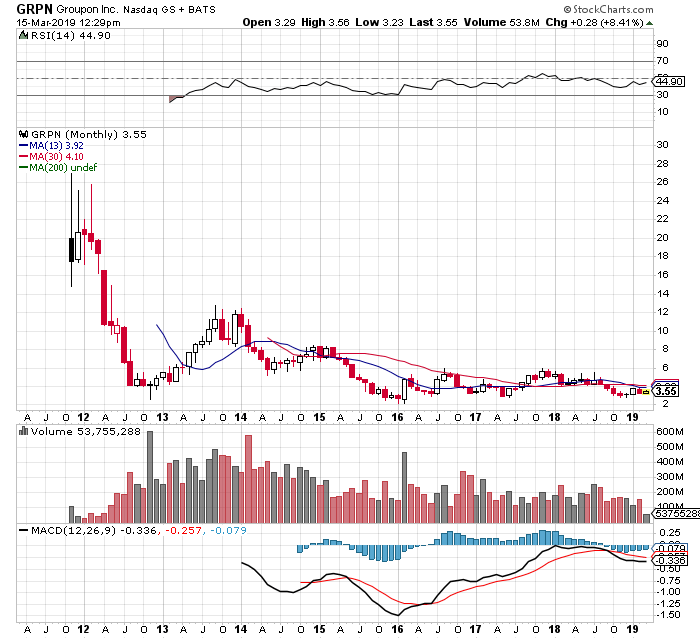 Here’s a look at the monthly chart of GRPN since its IPO date. Now, the pre-IPO growth rate was sustainable, and several competitors tapped into the space… leaving GRPN in the trenches. GRPN’s net income peaked in 2012, and sales peaked in 2015. That said, Groupon stock is preparing for the end of 2018 and the future. Revenue is expected to fall another 7% this year, but income is projected to increase from 2017’s 11 cents per share to 19 cents per share. In 2019, sales are expected to grow as well, leading to per-share profits projected to hit 24 cents. This could be highly beneficial for investors waiting for the uptrend. Zynga Inc. (ZNGA) is the company behind popular online games such as FarmVille and Words with Friends, to name a few. Even though many investors Zynga to be one of the hottest stocks. After Facebook dropped an exclusivity arrangement in 2012, the stock cratered and traded in a downtrend. In turn, this pushed the stock price under $5 per share, for years. However, the stock broke above the $5… and that could attract some technical traders. That said, the tides appear to be turning. The CEO and founder of ZNGA, relinquished control of the company by giving up two classes of voting shares. While this doesn’t mean that the lack of growth is his fault specifically, he wasn’t helping it either. The best part of ZNGA stock is that it’s not on many investors’ radar yet. Consequently, early investors can take advantage of the Zynga stock low and wait for it to gain momentum. Enphase Energy, Inc. (ENPH) is an energy technology company headquartered in California. It manufactures software-driven home energy solutions. In 2014, ENPH broke out of a two-year consolidation pattern and hit an all-time high in the upper teens. Now, in June 2015, it had a double top pattern, marked by two consecutive peaks in price… this signaled the reversal of an uptrend. Thereafter, the stock broke support at $9.50, entering a deep decline that ended with an all-time low of 65 cents in May 2017. Now, Enphase Energy is currently back on the rise. Heavy buying volume indicates that the stock is expected to see impressive gains soon. Moreover, it finally reaching its resistance at the broken top that should come to double digits. Bellerophon Therapeutics, Inc. (BLPH) is a clinical-stage biotechnology company based in New Jersey. BLPH’s all-time high was $12.92 per share in 2015. However, it hasn’t seen that price since then. The stock fell into steep downtrend… causing it to fall to an all-time low of 43 cents. However, the stock was lifted by two rally waves in 2017 and hit $2.74 per share. These waves were followed by a rounded correction, which saw prices dip to around $1.60 per share. The second quarter was a little better, and Bellerophon Therapeutics gained enough traction to achieve their prior high and break out. The three-year high is at $3.30. The stock is now around 70 cents per share, making it a good potential risk-reward opportunity. Genesis Healthcare, Inc. (GEN) is a provider of short-term post-acute rehabilitation, nursing, and long-term care services based in California. After going public in 2007, GEN stalled in the mid-teens and broke down in 2009. Thereafter, it entered a steep decline that led to share prices bottoming out at $1.43 per share in 2010. Genesis rallied in 2011 and posted a lower high at $15.93. In turn, this price action created a selling pressure causing it to reach support around $4. However, the stock broke down in 2016 and hit an all-time low of 60 cents in 2017. Since then, Genesis Healthcare gained significant traction for a 15-month high, which is expected to continue. Though still a speculative penny stock, the potential for GEN to come back to its original offering can mean big profits. Senseonics Holdings, Inc. (SENS) is a medical technology company based in Maryland. The company designs, develops and commercializes glucose monitoring systems to improve the quality of life of diabetic patients. In 2016, Senseonics Holdings shares hit $4.24, but declined well into 2017 to hit an all-time low of $1.26 per share. Confident buyers led to a recovery wave that stalled at $3.60 in late 2017. The stock then completed a cup and handle price pattern. This is a pattern that shows a “U” with a handle that has a downward drift, indicating a low trading volume and a bullish continuation pattern. This led to a breakout in June 2018, with share prices reaching an all-time high of $5.29… after that, pulling back slightly through the end of the month. Currently, the stock is trading under $3 per share, but has some support around the $2.15 level. Denbury Resources, Inc. (DNR) is a petroleum and natural gas exploration and production company that is incorporated in Delaware and headquartered in Texas. As discussed earlier, the success of exploration and production companies is dependent on oil prices. That said, the value of Denbury Resources shares has been fairly volatile. The all-time high came at $40.32 in June 2008 and was followed by a steep decline in global markets that resulted in a three-year low of $5.59 per share in November of 2008. The stock price began to rise in 2011 and then rolled over, entering another severe plunge that ended around 85 cents per share in 2015. In September 2017, DNR appeared to turn around, entering an uptrend that reached the 2016 resistance of $4.80 per share in May 2018. The next move will be critical for DNR. If it can turn around its business, it wouldn’t be farfetched to see this stock run above $3.70 (its 200-day moving average). Ascena Retail Group, Inc. (ASNA) is an American retailer of women’s clothing that owns such brands as Justice, Lane Bryant, and Maurice’s. Additionally, ASNA is the parent company of Ann Inc., the operator of the Ann Taylor and Loft stores. In 2014, Ascena Retail Group hit an all-time high at $23.14 per share and took a sharp downturn, breaking a two-year topping pattern in October. The downtrend continued into May 2017, reaching the lowest low since 1999. The stock stayed at that price for nearly a year, finally taking an upward turn in May 2018. ASNA broke out above the resistance at $2.70, reaching a high of $4.74. However, the stock has since pulled back, and is trading around the around $1.75. Now, the stock has some support around this area, and some investors may see it as a good risk-reward play. Neptune Technologies & Bioresources Inc. (NEPT) is a company based in Canada specializing in wellness products with customized nutrition and specialty ingredients. In September 2007, NEPT hit an all-time high of $6.09 per share, just a month after going public at $4.55 per share. Thereafter, it fell into an all-time low at 35 cents per share during the collapse of 2008. However, the stock caught a bounce and broke above $5 in 2012. A long-term downtrend that led into August 2017 ended above the 2008 high, which created a rally into February 2018. The stock pulled back at $2.25 and ran up in June, hitting a five-year high. Some traders expect this to continue higher, with the uptrend reaching the 2012 high of $5 per share. Cerecor Inc. (CERC) is a pharmaceutical company based in Maryland that focuses on pediatric health care. When it went public in November 2015 at $4.95 per share, it entered a trading range with support at $2.70 and resistance at $5. During the 4Q of 2015, the stock broke down and started a downtrend, and hit an all-time low at 34 cents per share in April 2017. However, the stock recovered and reached the 2016 resistance level in February 2018. In turn, the stock consolidated and formed a multi-year cup-and-handle breakout pattern. If CERC rallies above $5.75, it could attract strong buying pressure, bringing the stock into double digits. Urologix (ULGX) is a company that develops therapy options for adults with an enlarged prostate. With over 30 million men suffering from this problem, this is a huge market with a lot of potential for profitability. If Urologix could capture even a small percentage of that market, their current share price of 20 cents per share could skyrocket into $2 per share. Because of this earnings potential and the bullish chart, Urologix is expected to be a solid stock to own through 2018, with the potential to go even higher than $2 per share. Rainmaker Systems Inc. (VCTL) focuses on learning management systems for Fortune 500 companies, such as HP, Abbott, and Ariba. This stock has a low number of shares, and it’s looking to grow and target more Fortune 500 companies, giving them the potential for hefty profits. If such deals go through, Rainmaker Systems stock could see a significant increase. Now, if the market cap reaches even 43M, the stock would rise to $1. Now, there are plenty of ways to make (or lose) money trading penny stocks. But, if you want to be successful at trading them, then you’ll need to have a strategy that has an edge to go with your trading plan. That said, there is no one in the game trading penny stocks like Jason Bond. In fact, he made over $250K in the first two months of this year trading penny stocks! All you need to do is sign up to his free training. He’s going to be teaching the three strategies that have helped him become one of the nation’s top penny stock traders. 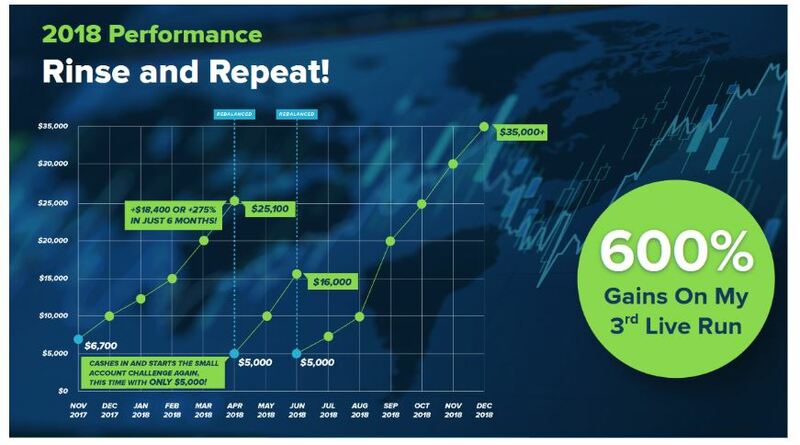 Self-made multimillionaire reveals his three best strategies for trading penny stocks.